I'm just wrapping up a 10-day stay in Mumbai, India, where I've been immersed in the energizing learning environment of American School of Bombay (ASB). corner: urban slums near posh shopping malls, rickshaws sharing the roads with limousines. Step inside ASB and you notice colorful student artwork, thoughtfully designed interiors, and abundant greenery. It may feel like an urban oasis, but this is really a laboratory for innovation. Long recognized as an ed-tech leader, ASB continues to push the edges. I heard about a number of ambitious initiatives at various stages of implementation, including design thinking, makerspaces, and project-based learning. Students also take on service-learning projects in the community, building empathy along with problem-solving strategies. These aren't random or disconnected programs. Together, they form an ecosystem for learning. "It's all about what's best for kids," says Dr. Shabbi Luthra, a deep thinker who oversees research and development, along with technology, for ASB. What happens when students and teachers are immersed in an environment that encourages innovation and risk taking? Here are just two examples. 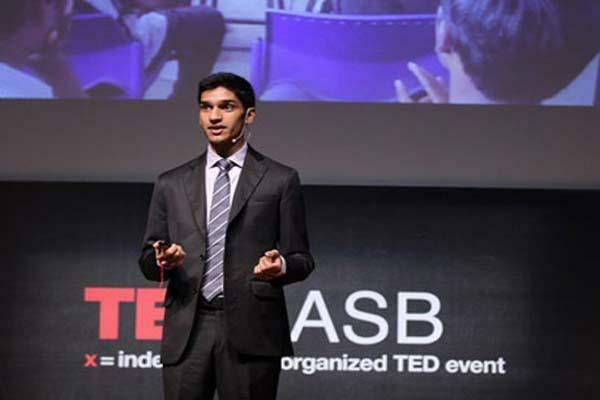 Eshaan Patheria was a ninth-grader when he and some classmates had the idea to share their technology know-how with less privileged students in Mumbai. The result is a program called Plugged In, which aims to bridge the digital divide by having teens teach teens. Eshaan, now a twelfth-grader, spends most Saturdays in the Plugged In classroom at a partner school, Jagannath Shanker Sheth (JSS) Municipal School in South Bombay. JSS is about an hour's drive from ASB, depending on Mumbai's notorious traffic. But the greater distance is economic. Until Plugged In got underway, JSS students had no access to technology. There was a computer room at the school, but a log showed that it was last used in 2000. Moisture and dust had taken a toll on the outdated equipment. Even the user manuals were termite infested. "We thought we could just go in and teach some technology lessons," Eshaan told me. "We didn't know the reality." Eshaan shared some of the struggles of launching Plugged In in a moving speech at TEDxASB , an annual event that coincided with my visit. He was candid about how much he and his peers had to learn as they designed the program from the ground up. What gave Eshaan and his team the confidence they could not only overcome bureaucratic hurdles to start a program, but also sustain it for the long haul? "That autonomy, the drive to start comes from having mentors who believe in you and encourage you," he says. "To have an adult take your idea seriously -- that's encouraging." Eshaan says he also was motivated by the response from JSS students. A boy named Shubham, for example, has blossomed through Plugged In, moving well beyond tech basics to tackle coding. He's especially keen on simulations, which enable him to learn about science despite a lack of lab facilities at his municipal school. "We came to appreciate his curiosity and his true capacity to be an independent learner," Eshaan says. The Plugged In team even managed to buy Shubham his own laptop -- only to discover that the boy's family could not afford electricity at home. "The stark reality of that was disheartening," Eshaan admits, but the roadblock has given rise to his next big idea: engineering a power source for Shubham's neighborhood that could be fueled by burning trash. The idea is still in the early stages but could be game-changing for India's poorest citizens. Biology teacher Rory Newcomb has been a long-time mentor to Eshaan. Currently in her fourth year at ASB, she has been teaching internationally for 14 years. Before that, she taught for three years in her home state, Texas. On the day I chatted with her, Newcomb was buzzing with excitement over a new idea for her IB Biology class. Students had recently introduced her to a game called QuizUp, in which players can challenge each other to face off on quizzes on specific topics. Her response was to try the game herself, focusing on the biology category. When students noticed her name creeping up the leader board for all of India, they started challenging her. "Even when they'd lose, they would rematch me." Convinced that this could be useful for reviewing biology content, Newcomb contacted the game creators. She offered to have her students create a new game category and write all the questions (and answers). "My students are ga-ga crazy over this game," she says. "I'd love to leverage that. We could use QuizUp, and students around the world could use it, to prepare for their IB exams." Game designers agreed, and Newcomb's students have a plan to write 300 game questions by the end of their winter break. Which student first told her about QuizUp? Not surprisingly, it was Eshaan. "My role in the classroom is not to deliver content," Newcomb says. "It's all about listening -- and listening some more. You listen to find out, what do students wonder about? What are their frustrations, their passions? My job is to listen and then make connections, to turn them into knowledgeable networkers as opposed to knowledgeable workers." This student-centered philosophy began to take shape years before Newcomb arrived at ASB. She credits a former colleague from an international school in Venezuela with teaching her about the importance of relationships. "A teacher named Rich Lehrer taught me that the connection with kids is the first and only thing that's important," she says. Read more on Edutopia website .